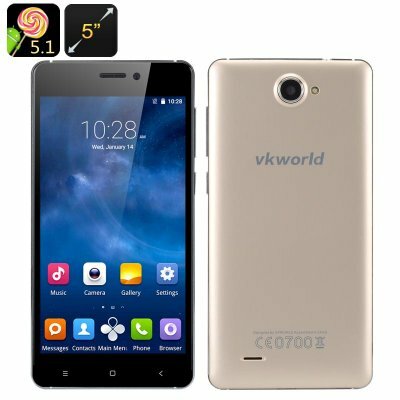 Successfully Added VKworld 700x Android 5.1 Smartphone - 5 Inch IPS Screen, Corning Glass, Quad Core CPU, Smart Wake, Dual SIM (Gold) to your Shopping Cart. The VKworld 700x is a great entry level smartphone coming with a very attractive price and a boasts a nice set of smart features. It comes with a 5 inch HD screen, Android 5.1 interface, a quad core processor, Smart Wake and more. Have you seen those videos on YouTube when a smartphone screen easily cracks walnuts? Well, now you have found that smartphone. The VKworld 700x features a 5 inch HD screen with Gorilla Glass protection. This means that you will not only have a beautiful device, but also a sturdy one. Smart Wake is a great feature to have handy – it guarantees quick access to some of the most popular apps from the locked screen. The VKworld 700x comes with great connectivity. You will have 3G at your service + the option of making the smartphone a Wi-Fi hotspot. With two SIM card slots, you will be able to separate your mobile life into work and personal. With a powerful quad core processor, the phone can take on lots of multitasking and let you enjoy all your apps and games in full – especially, with the Mali 400MP GPU. With 8GB of internal space and the option to add on 64GB more to that via a micro SD card, you’ll have plenty of space for all your content. With a nice elegant design and a fancy golden color, the smartphone is a great entry level option – and you’ll be pleasantly impressed with its friendly price tag.